Whether it’s the heat of the summer or middle of winter, I’m always up for a scoop of ice cream. In fact, I probably eat more ice cream during those cooler months when I know no one is going to see me in a swimsuit for a very long time. Fun fact, these photos were snapped a while back when I was pregnant (so there really wasn’t any worrying about getting into my bikini again anytime soon). 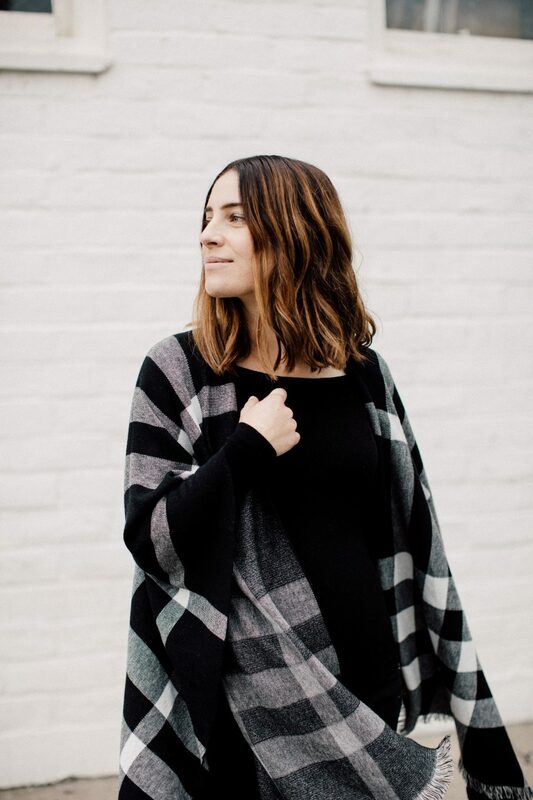 I love a good dose of plaid around this time of year and this wrap is the perfect cozy, throw over anything layer. Additional plaid favorites below–like this cute under $40 option! Fun Fact #2 | Vic’s is one of the oldest ice cream parlor’s in Sacramento–hence the old school charm. There’s something nostalgic about sitting on the stools at the counter or in one of their comfy booths that takes you back to being a kid, and now I can’t wait to bring our little guy here for milkshakes one day. Whenever my guy and I have a hankering for ice cream (which was fairly often during my pregnancy) we come to Vic’s. They also serve a quintessential American grilled cheese cut in four squares–just how mom used to make if for you–if you’re wanting the full dose of childhood nostalgia. Speaking of ice cream, another local favorite is Gunther’s. It’s also right up there with Vic’s for us, but I recommend a drive-by to see how the line is. If too long, or you feel like sitting, head straight for Vic’s where you can usually always grab a spot at the counter. The Look | Getting Back to Square One Top. Citizens of Humanity Jeans. Splendid Wrap (similar affordable option + also loving + love this all black hooded style). Isabel Marant Boots now on sale! (similar cool vibe).